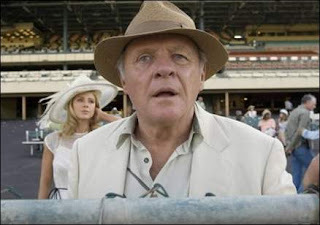 “I perceive life as a game, a game that we play at some unconscious level,” Anthony Hopkins explained to journalist Scott Macaulay in the Fall 2007 Filmmaker Magazine article “The Hollywood Life” which chronicled his latest experimental puzzler Slipstream from its birth as a stream-of-consciousness screenplay to its wild shoot and inventive post-production that found Oscar winning Anthony Hopkins both in front of the camera and behind it serving as the writer/director/star and film score composer as well. While the film, which explores “the strange nature of time” is a wild opus purposely created to “annoy the audience” as the actor explained may be his own version of a game, the question then becomes in asking whether or not viewers will want to take part as, like Mulholland Drive, Inland Empire, 8 & ½ and Last Year in Marienbad, it infuriates its audience with constant shifts in plot, character, and text that continually build on itself until we realize that it’s a film within a film within a film just like our main character, the “film’s” screenwriter Felix Bonhoeffer (Hopkins) is, as Vince Vaughn may have said in Swingers, the guy behind the guy behind the guy. Although Felix is perceived to be a main character, the film focuses instead on several others as the movie begins and we meet Michael Clarke Duncan as a bouncer of sorts and two villains played by Jeffrey Tambor and Christian Slater who decide to hold up a diner, not for any monetary gain, but just for the sake of menace as Tambor and Slater ramble out an increasingly crazy story about the 50’s film Invasion of the Body Snatchers and Slater’s typical Jack Nicholson styled cadence becomes far more frightening with each passing minute. Then, as soon as we’re beginning to grasp this nonsensical storyline, a “cut” is yelled and we’re taken behind the scenes of a sloppy film shoot in the desert that will soon find one actor dead and the rest all struggling to figure out how that will affect the film, with studio head John Turturro (given a majority of the picture’s best lines) arriving on the scene like a domineering madman. Filled with Hollywood in-jokes as Turturro’s character named Harvey seems on some level to be a nod to the controversial tactics and persona of former Miramax head Harvey Weinstein, an off-screen phone call from “Dino” (De Laurentis) about casting Hopkins in Hannibal 4 as long as the price is right and a joke about films being cheesy dreams that can find Huckleberry Finn fishing on the moon similar to the image used as the Dreamworks logo. In addition, Hopkins casts his wife and the film’s producer Stella Arroyave as Gina, the wife of his character Felix and soon the film morphs from an Altman styled Player satire of the film business into one concerned with the past and of how characters came to be where they are in the face of their own mortality. While an indisputable vanity project and one that will have most viewers reaching for the eject button within the first half an hour, it’s still an artistically imaginative ride for those willing to participate and while it’s nowhere near as effective as the films its emulating such as Marienbad or as I began to feel, literature from Kafka or Calvino, it’s of particular interest to film students who appreciate the amount of work that goes into experimental filmmaking and even more, the amount of dedication and artistry from those involved. Instead of being Hopkins’s film all the way, in the end, the real star of Slipstream and the one responsible for a large majority of its moderate success as a valuable work is the courageous editor Michael Miller who not only respected Hopkins’ vision but also added a dazzling sense of style to the picture giving it a feeling of more depth at times than it actually deserves in the process.